Home > ComforTek Church Chairs Put to the Test! Superior plywood is used on all chairs. Back features 1/2” thick plywood backing for extra support. Radius ‘Comfort’ back with lumbar support, for long term comfort. We take comfort very seriously in the design of our chairs. Waterfall cushion on seat bends down at an ideal slope. Provides comfort to guests seated for long periods of time. Card pocket is sewn onto seat back. Non-Marring nylon glides are standard on the bottom of chair legs. Designed for delicate floors, such as tile. ComforTek stocks some of today’s top colors, patterns, and finishes. Visit www.ctsfabrics.com to view all fabrics. 15 years on CCF foam. Other accessories and customization options are also available. 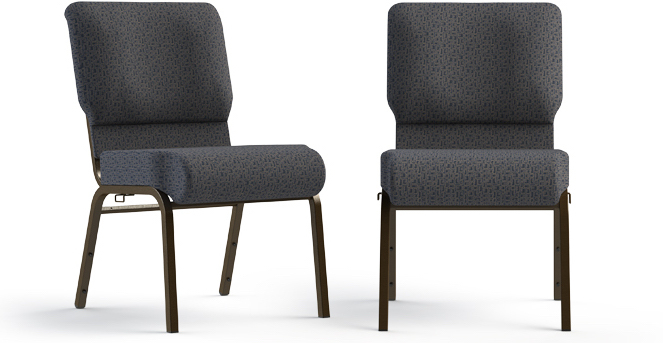 Will ComforTek chairs meet the challenges for your church situation? Please contact Church Chairs by ComforTek today and we’ll be glad to help find out which of our chairs will best suit your needs!